It's been a bit of a Land Rover couple of weeks. I've spent a lot of time under or in our Discovery 2. On Saturday I fitted the heavy duty bumper and steering guard that I ordered from Torque Performance. I spent ages looking round for a bumper that looked good and provided the strength I wanted for off-road use. I want a car to use off-road but I also only want one car so it needs to look nice as well. This shows the end result. Torque Performance made it and were ready to ship in about a week. I had to delay things because I needed a Saturday delivery. I started removing the old bumper about 9am and worked all day. I had tidied up all my tools and was back in doors at about 7:30pm. I think most people could do it quicker than that but I stop to take a lot of photos as I go plus the odd distraction. The steering guard does not come with any instructions for fitting so I had to work that out but luckily removing the old bumper is covered by the Discovery 2 Accessory fitting guide. Page 152 covers fitting a light bar which includes removing the bumper. This is handy because before I read that I had a completely different expectation of where the bolts would be. Removing the bumper should be a fairly easy job but as always the problem is removing stubborn screws. The screws holding the wheel arch liner were the most difficult. 6 out of 7 on each side were easy, one I had to drill out and one unbolted from the wheel arch instead of unscrewing from the liner. Once the liners are removed, you can easily see the bumper bolts. It is worth knowing that the side studs run in a slot, so the nuts only need to be loosened rather than fully removed. I also removed the grill but that was because I was replacing it with a pimped version. There are a few cables and the headlight washer pipe to disconnect but the removal is fairly easy. I did the entire job on my own, supporting the bumper on timber, so it did not drop. 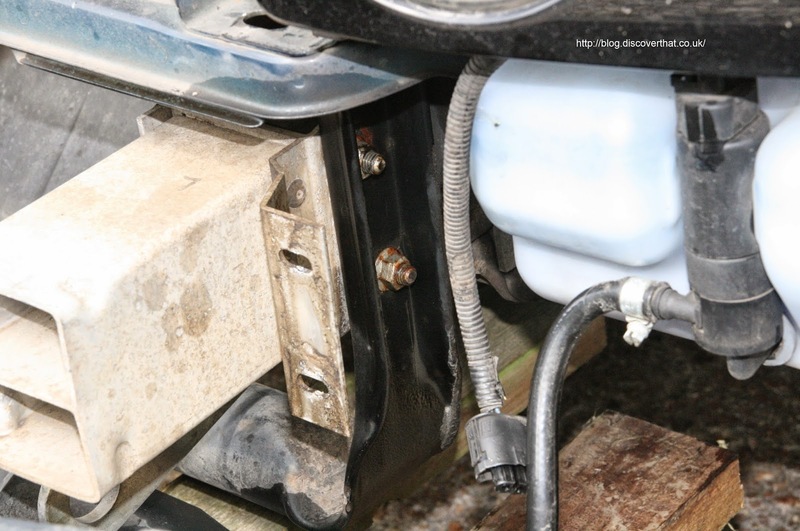 Once the bumper is off the crush cans can be removed from the end of the chassis as these are not used by the new bumper. The heavy duty bumper does not provide positions for the washer jets. These are too easily damaged for off road use so I am glad to get rid of them. I was not sure how to seal off the pipe. I did not have anything suitable to block the tube, so I opted for clogging up the washer pump with mastic and refitting. Some people might not like the idea of deliberately ruining a perfectly serviceable component but I had no further use for it, except to block the hole. I also disconnected the cables and taped up the connectors. Now I was ready to start fitting the new bits. The first fitting job was the steering guard. This was the hardest job. It fits using two of the steering box bolts on the drivers side (UK right hand drive) and an existing hole in the chassis on the passenger side. The hole on the passenger side is covered by a plastic liner. Although the three screws are easy to remove, forcing the liner out of the way is tricky. With a bit of bending it is possible to get it out and back in again. The liner needs to be cut round the nut to get it back in. The steering guard is heavy and awkward. The bracket is a tight fit for the chassis and it has to go under the anti roll bar and over the track rod. I used a trolley jack to support it while I aligned it. I had a bit of a delay at this point because I didn't want to remove the steering box bolts until I knew what torque setting was needed to put the bolts back. Eventually I found it in the Haynes manual which stated 90Nm. For mounting at the chassis end, Paul at Torque Performance, gave me a pointer on the phone when I placed the order. He said slip the bolts part way in through the steering guard holes, then offer up the bumper and push the bolts through to support the bumper. There is a lot of allowance for variations in Land Rover sizes and for other accessories so the steering guard needs bending slightly to get enough bolt to stick through to fit the nut on. I used a G clamp just for a moment to get the nuts on. The bumper has huge slots so it was easy to just slip the bolts in at any position and then adjust to the desired height and angle when tightening the nuts. I could have done with some thick oversized washers as the slots are quite wide. I did not have any to hand but may retro fit some another day. I used some 6mm timber to make sure the gap was even round the bumper. From then on it's all plain sailing to finish the job. The lamp bar is extra but easy to fit with three allen bolts on either side. I did have to file down a washer to make it fit as the hole was close to the bumper bracket. I fitted the number plate with steel bolts and number plate stickers just to be sure. This whole renewed interest started when we forded some deep water that washed the number plate off early in the year. It was a busy weekend and there will be a couple more blogs on what I changed next on the Discovery. October 2014: I now also have the matching rear bumper. September 2016: The powder coat had fallen off and the bumpers rusting so I have cleaned them up and coated in U-POL Raptor load bed liner.